Snapchat stock was up nearly 5% Monday after the company announced that it's testing a feature that will allow users to search for products on Amazon by using Snapchat's camera. Why it matters: Snapchat has invested heavily in making its app more than just a tool for selfies. It wants to become a utility for users that can help them search for products, experience augmented reality and, now, shop. How it works: Users can now open the Snapchat app and point their camera at a physical product or barcode. Once the camera scans and recognizes the item, it will prompt a card with a link for the product or similar ones available on Amazon. Users tap the card and are then redirected to complete their purchase through the Amazon app. Sound smart: Snapchat is primarily thought of as a social media company, but these investments in its technology will help it become more like a visual search engine. The big picture: Social media apps are becoming disruptive e-commerce players, mainly because they are able to leverage social data to better understand and cater to users' interests. 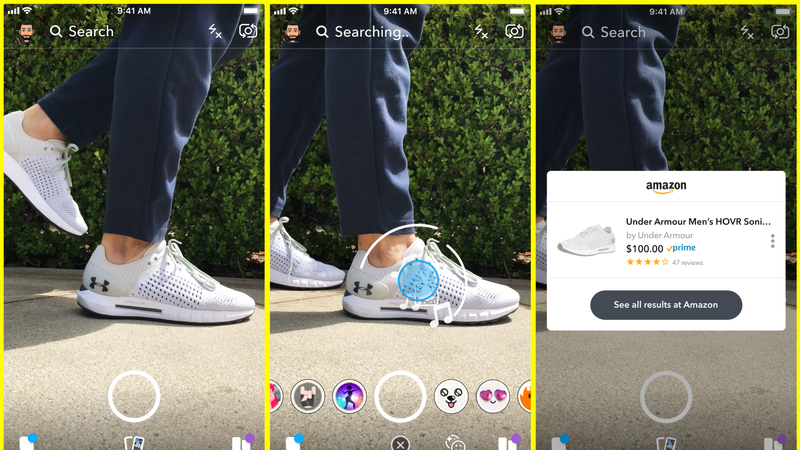 Snapchat began rolling out ads that feature augmented reality in April, giving marketers the ability to let users virtually test their goods before buying them.